Well friends, our ugly foyer is well on its way to being gorgeous! And it’s all thanks to our DIY plank wall. I know white shiplap is all the rage these days thanks to Fixer Upper. I love the look of a fresh white wall too, but what I really wanted was the look of a gorgeous reclaimed wood wall – without the stress of finding and dealing with actual reclaimed wood! 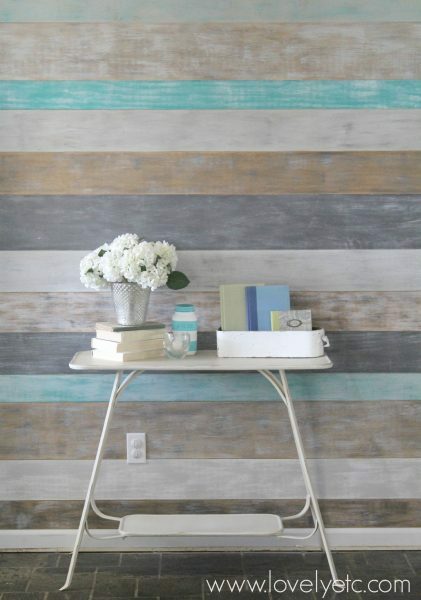 And this painted plank wall definitely fits the bill. Even better I was able to complete this painted plank wall for less than $50! To keep costs down, I used 1/4 inch plywood to make my planks. I read a lot of tips about saving money by using masonite, but I knew I wanted to incorporate some wood grain into my plank wall so masonite wasn’t a good choice for me. This post contains affiliate links – you get to buy cool stuff you want and support Lovely Etc. at the same time. See my full disclosure here. Once your planks are cut, the next step is paint. For a unique look like this, it is so much easier to paint each plank before installing them. My plank wall is a fairly small entry wall – it is only eight feet wide from the closet door to the corner. Since the plywood is eight feet long, I simply did one plank per row. If you are planking a longer wall, you will need more than one strip of wood in each row. 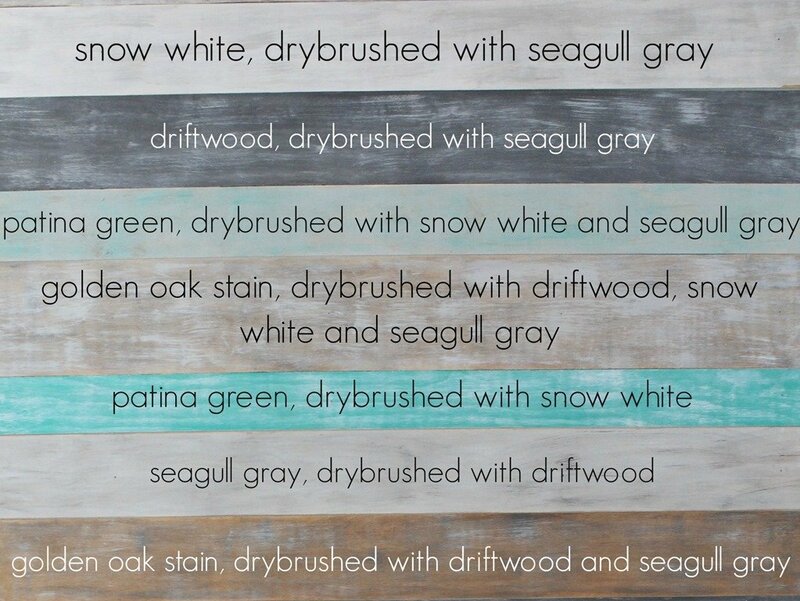 You can either paint all the wood in each row the same for a striped look like my wall or mix up the finishes for a more eclectic look. I knew I wanted a textured, weathered finish to give the feel of reclaimed wood and my go-to technique for this is dry-brushing. Dry-brushing is incredibly simple. Chip brushes are ideal for this, but you can use any paintbrush. Put a very small amount of paint on your brush and then wipe as much off on the lip of the paint can as possible. To remove even more paint, you can wipe your brush on a paper towel several times. Basically, you want your brush as dry as possible while still having some paint on it. Then lightly brush your paint across your board. I got a ton of questions about how exactly to do this so I put together a quick video that makes it easy to understand. , and patina green. I love General Finishes paint (and that patina green is amazing), but you can also get this look with almost any paint. A paint with a matte finish will work best, so you could use chalk paint or even acrylic craft paints from a craft store. In the video I used Americana Decor Chalky Finish paint in everlasting (white), yesteryear (light gray), relic (dark gray), and treasure (turquoise). I also used a bit of stain on some of my boards before painting to highlight the wood grain. Check out all the different finishes I was able to get using only four colors of paint! Once everything was painted, it was time to install the wall. Let me say right now, I do not have a nail gun. And if I did, I would probably be scared to use it. You can totally install a plank wall using an old fashioned hammer and nails. My husband, Mitch, and I worked together and we were able to get the whole thing installed in just a couple of hours. I started out by cutting one of my four inch strips in half to make 2 two inch strips. I used these as a sort of molding along the edges of the plank wall. Then I used a stud finder to mark where the studs are in the wall. Because the plywood is so light, the planks were quite easy to hang. We simply nailed them up with a finishing nail in each stud. (This worked out to three nails per board.) This way, it is possible for us to remove the planks if we decide to change things up or put the house on the market in the future. As we were hanging the planks, we used a few pennies between each board to keep the spacing between boards even. This wall seriously looks gorgeous no matter how you decorate around it. Below is a picture of how it currently looks – swoon! This is such a doable project for any DIYer, even if you are a beginner. It is inexpensive. You don’t need fancy tools. You don’t need to find special reclaimed wood. And you don’t really need any special skills. If you decide to go for it and make your own plank wall, be sure to share pics of your completed project on my Facebook page. I would love to see what you create! I am very interested in doing this but my dilemma is I’m in a rental. Is there anyway I can create this without having to nail each plank to the wall. Like maybe construct the entire piece but how would I adhere it to the wall? Any suggestions? Good question. You might be able to attach each plank to one large sheet of thin plywood and then just attach that sheet of plywood to the wall. Are you allowed to hang pictures at all? If so, a few nail holes in the wall should be okay. You may be able to nail the whole thing up with a few well placed nails along the top and sides. Especially if it is resting on the floor/molding on the bottom to help with stability. (But if you have kids or large pets, I probably wouldn’t go this route.) Good luck! So I am trying to do this on the main wall in my nursery. You say what dimensions you cut the boards but how large is the wall you did. My wall is 8 ft tall and 9 ft wide. HELP?!?! This will look so great in a nursery! My wall is right around 8′ x 10′ but a closet door at the end made the majority of the wall 8′ x 8′. Since the plywood is eight feet long, I was able to just use a single board for each row. Since your wall is a bit over eight feet, you will probably need to stagger your boards a bit to cover the entire length. Just make sure to stagger the seams between boards. One easy way to do this is to add a one foot long board to each row, alternating which end of the wall you add it on. Since each row will have more than one board, you could choose to paint both boards in each row the same colors or do different colors on every single board. I would probably go with a single color for each row, but either way could look beautiful. Also, you will want to make sure the two boards for each row are cut to the same height. Good luck and let me know if that doesn’t make sense or you have more questions! So how much material should I buy. I’m with you on one color per! It’s to bad I can’t get larger board. Or can I? As far as I know, you can’t get plywood bigger than 4′ x 8′ at any typical home improvement store. I would buy 3 4′ by 8′ sheets of plywood. The first two sheets can be cut the same dimensions I mentioned in the post. The third sheet will need to be cut so that you end up with 8 six inch strips, 4 eight inch strips, and 4 four inch strips. Depending on the exact width of the wall, each of these strips needs to be around a foot long. So a couple months ago I stumbled upon this blog post (via Pinterest) and LOVED it for an idea for my nursery!! We finally finished it this weekend and I wanted to share the results with you (although I don’t think I can post a picture here), so I have written a post on your Facebook wall. Thank you soo much for the awesome idea and great instructions!! I am so happy the way it turned out. I also tagged you in my FB post showing the photos (hope that’s ok – as you deserve credit for the idea)! And by the way, congratulations on your new baby boy!! Kati, that is awesome! I can’t wait to see it – going to check it out now! Hi there! I have a question regarding how you cut the boards. The dimensions you gave, are they cut across the board 4′ or along the 8′ edge? Thanks so much!! Great question! They are cut along the 8′ edge so that the final boards are 8 feet long. That is wonderful! Thanks for including me! 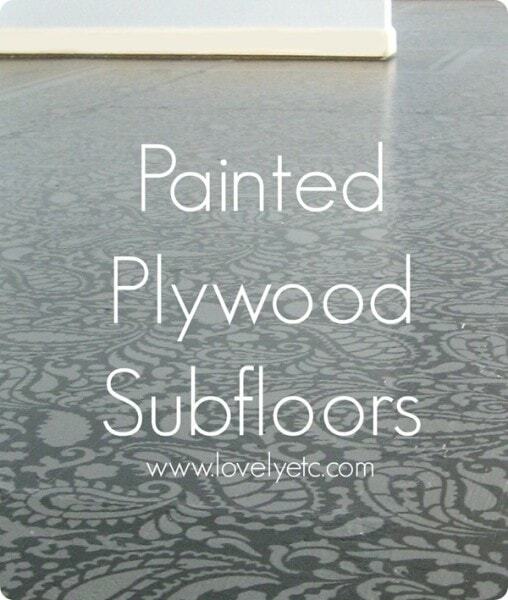 Did you sand the plywood before painting? I imagine a rough service may catch dust and be difficult to clean…how have you found this to be after time? Laura, I did not sand the plywood before beginning but I did choose a thin plywood with a pretty smooth finish to use for this. I have to admit, I am not always the most motivated cleaner and I haven’t truly cleaned this wall but I also don’t see any dust or other things caught on the surface causing a problem. Kristal, sounds like an awesome idea for your cabinets! Let me know how it turns out! This is so beautiful! I have a very crooked wall in my kitchen and am having trouble with tiles for a backsplash. This may be perfect! But I think I would need to seal it with something. Thank you for sharing! Kathy, glad I could help give a new idea. I didn’t seal mine and the paint has held up well but you are right, sealing would really help as far as being able to wipe down the wall. 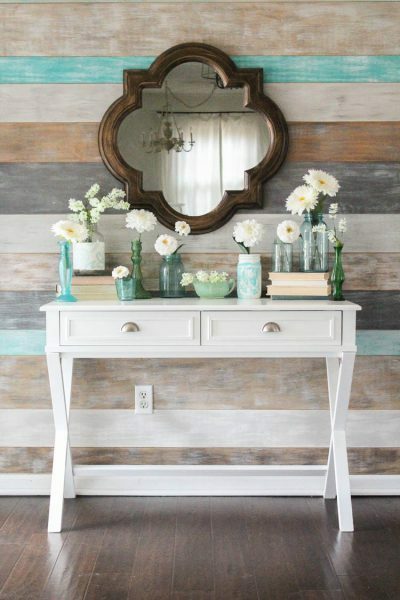 I’ve also seen some wallpapers that look like a rustic plank wall that might work well for what you have in mind. Gorgeous wall!! I love it. I was wondering what other brand of MILK paint you would recommend. I live in a state that doesn’t carry this General finishes brand. I just want to buy some sample sizes of this paint and I can only buy the quart sizes on AMAZON. Any suggestions or will any milk paint work??? Holly, great question. 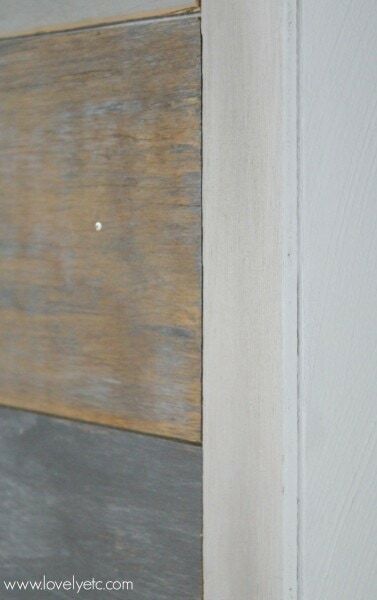 If you aren’t able to get the General Finishes paint, really any paint will work for a plank wall. It doesn’t have to be milk paint. I also really like Americana Decor chalky finish paint – you can buy it at Michaels and it is pretty inexpensive compared to other chalk and milk paints. But for this project, sample sizes of latex paint would also work well. If you are just interested in milk paint in general, I know some sellers stock samples of Miss Mustard Seed milk paint, but I don’t know a specific one off the top of my head. I plan on doing this in my home office. My ceilings are really short (under 7.5 feet) so I was considering going vertical instead of horizontal to give the illusion of height…..but it might look too much like old school paneling. Any opinions?? Julie, I think it could look really great going vertical. 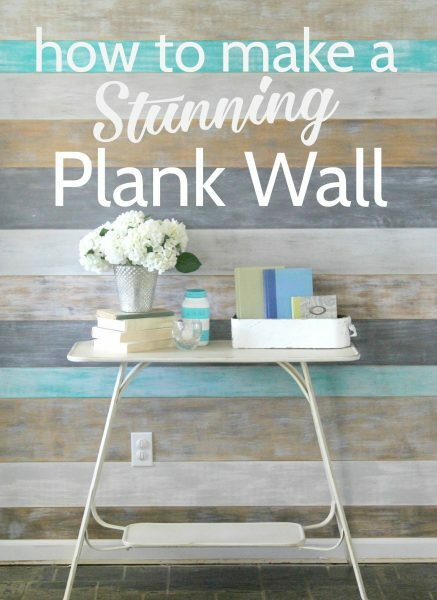 One of my favorite plank walls I have ever seen was vertical – it is the second inspiration picture in this post. http://www.perfectlyimperfectblog.com/2011/07/installing-wood-paneling.html I think if it is done well, it won’t look like faux paneling at all. 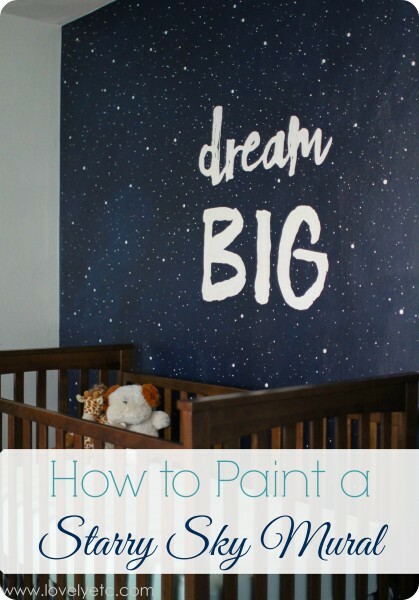 I wanted to do a plank wall in my nursery but never really seemed like something I could do. THIS seems like something I can do! Looks amazing. Thanks for a great tutorial. Jolene, I am so glad! I love a good feature wall in a nursery. I would love to see pictures if you end up doing this! OH MY GOODNESS! I love this wall! Thank you so much for the tip on a dry brush; I tried a similar project once and the paint was too think. I am going to try this after Christmas! Thanks Becky! I hope if you try this you love it! Let me know if you have any questions once you get started. Julie, how exciting! Yes, I painted one coat of the base color over the entire board and let it dry for about ten minutes. Then I went back over dry brushing. The first coat is super easy, but dry brushing can take a few tries to get just how you want it. When you are dry brushing, be sure to wipe almost all of the paint off your brush before painting with it. Then if it is lighter than you want, you can always add a little more. It wouldn’t be a bad idea to practice on a scrap piece of wood to get it just how you want it. I have a doorway at the end of our plank wall as well. I didn’t put the trim over the planks because like you said, that would be very thick. I just butted the planks up against the edge of the trim. I hope that makes sense. If not, I can try to take a picture. Beautiful! What type of wood did you use? Also, you mentioned using pennies to even out the spacing. Do you mean you put them between the strips horizontally? Where the strips not touching then? We used a high quality plywood – I don’t remember which type exactly, but it was a smoother, stain grade plywood. And yes we just stuck a few pennies between the boardds horizontally so there is a small space between each board. It isn’t a very big space – you can’t see the wall behind at all, but with no space the planks would start to run together. THIS is BRILLIANT! I’ve been researching a few different pre finished reclaimed wood plank brands; some peel & stick, some nailed up, and although gorgeous, a bit more costly than what I’d like to spend (especially for a project I’ve not attempted before)! This is EXACTLY what I needed! 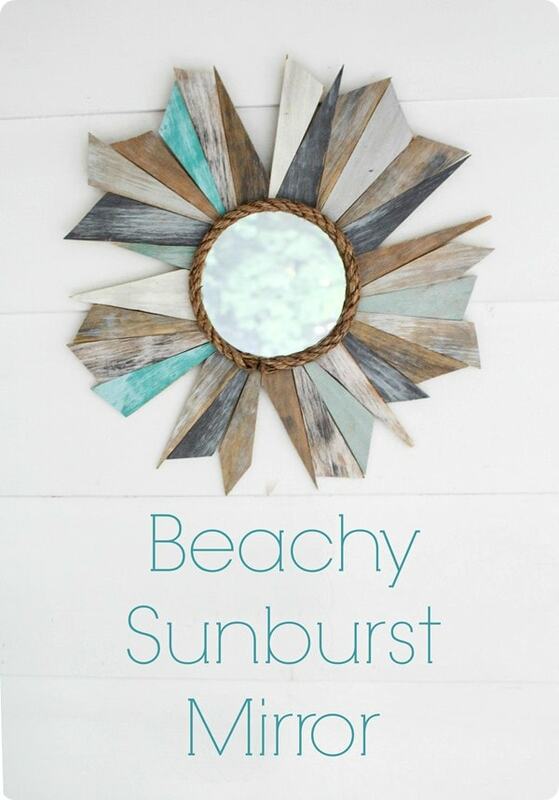 I plan on doing this in my (even more boring than your) entryway, which will give it that pop of life it so desperately needs ;) I have a side table that I’ve been wanting to paint a bright coral (possibly SW Begonia) and the colors on your planks are the perfect combination to pair with coral. I cannot that you enough for sharing this rad project! BTW, any tips or hints to make this easier on a newbie like myself? Yay! I am so glad you are going to try it! This wall really is easier than you would think. I would just recommend having someone else around to help out. Having the wood cut in the store also helps immensely though you will still need some sort of saw at home to cut the final piece by the ceiling and to cut your boards to the right length. And your table painted coral sounds gorgeous! Good luck! Let me know if you have questions. What type of wood is the plywood you used? Maple, Oak…? To be honest I don’t remember. I just went to Lowes and looked at the plywood options they had. I chose one that was the thin and had the amount of texture I wanted – not perfectly smooth but not that rough either. Sorry I can’t be more help! I’ve got my paint and am ready to get started :)!! What are your thoughts on painting the 4×8 boards before cutting them? I was thinking of maybe doing the first coat, cut the strips, then dry brush the second coat. Yay! You are going to love your wall! You could definitely paint your boards before cutting them if that is easier for you. For me, it is easier to visualize how everything is looking together when they are cut first. There is a chance that a little paint may chip off during cutting, but it shouldn’t be too hard to touch it up afterwards. Good luck! I would love to see a picture of your wall when you finish. My daughter and I did this over the weekend on our walls. We bought everything Friday. And, I can’t say enough about Lowes! Having them cut the wood made everything so much better. I used to love chalk paint, but after purchasing this milk paint by General Finishes, I will NEVER GO BACK TO CHALK PAINT. Milk paint covered so much better and I loved the consistency better as well. We literally started painting at 10 on Saturday and was done and had my wall completed and my daughters was 3/4 done by 10 p.m. that night. Her wall was a lot bigger than mine so we were one 4 X 8 plywood short. We got that on Sunday and then finished her wall. Her wall was done with 4 foot 4 inch planks that were stair stepped in style. Wish I could show you pictures. Absolutely amazing. Now onto my cabinets with this MILK PAINT! Yay! Thanks so much for sharing your experience! It makes me so happy when readers do something great in their homes and it sounds like both you and your daughter created some fabulous walls. I totally agree – General Finishes paint is wonderful. I do still love chalk paint for some projects, but this paint does cover much better and holds up so well. Thanks so much for commenting! Love love love it. Just what I was looking for. So many helpful ideas. Thank you for being so generous with your advice. I am definitely subscribing to your blog. I love this DIY! I was looking on amazon for wooden planked walls, but to fit the wall I want this on in my new room, it would cost around $400! Yikes… Then I found this blog, and I am definitely doing this!!! Jaycie, I am so glad you found this! You can definitely get a great wall for less than $400. And nobody will know you did it for less! Does the milk paint come as powder and you have to mix it with water, or does it come already mixed? Jaycie, this milk paint is different from other milk paints that give a chippy, antique look. It is more like an acrylic paint. It comes premixed in a paint can like most other paints. Love this!!! Unfortunately I can’t find the general finishes milk paint anywhere locally and Amazon wants over $30 per quart. Can u share how you were able to complete this project for such a low price? Tracy, I used General Finishes milk paint with great results but you could get a similar effect with almost any paint. Latex paint samples would work but I think craft paints would work even better. They are super inexpensive, come in every color, and have a matte finish that would look really great for this. Thanks! Good luck with your wall – I love mine! Was it necessary to sand the long edges of the individual pieces? I love the look! Thanks! I don’t think we sanded the long edges and you shouldn’t need to unless there are splintery rough spots. It doesn’t need to be perfectly smooth and perfect since this is a somewhat rustic look. Hi Carrie! Your wall is amazing. I plan to create this look in my home. How do you hide the finishing nails? Thank you Netta! We didn’t actually do anything to hide the finishing nails but they aren’t very noticeable. If you look closely, you can see them but I’m ok with that. I feel like the nails go right along with the rustic, authentic look. This is absolutely so cool. I read the whole article and I am certainly doing this. Thanks for the great step by step instructions. I don’t use a nail gun either and the ease of which you explained everything makes me feel like I can do it!!! Lowes here I come..lol. Great job. Thank you Gail! I know you can do it! How did you do this for $50? The paint is way more than that. How did General Finishes provide you with the paint to do it? Hi Kim! General Finishes sent me the paint to try and you are right – buying all of those different paints would definitely take the cost over $50. But you can 100% get the same effect using other paints as long as they don’t have a glossy finish. 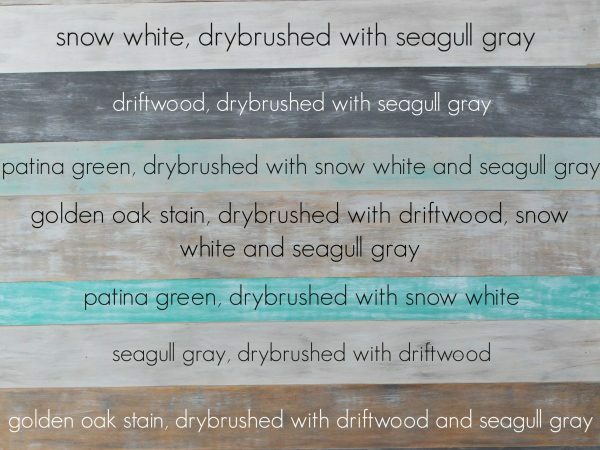 If you use paint samples that are similar colors, you could definitely do it under budget! Sooo, does ANYONE have ANY pictures to show/share with us of a plank wall, in which they did, that was inspired by Carrie’s plank wall where she also asked to be shared? I’d loved to see some of the work of others! Thanks! Great question Jennifer! Several people have shared some on my Facebook page but I don’t know of an easy way to share them here! 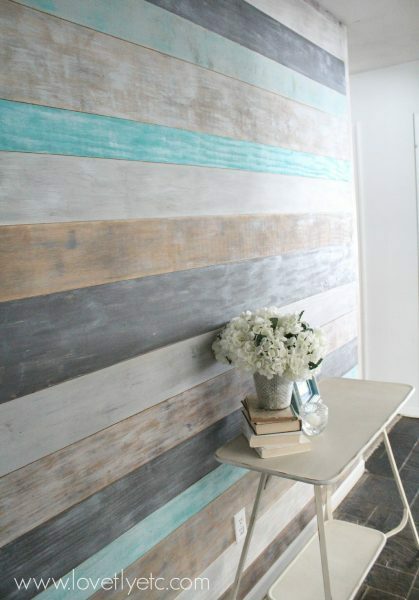 I love love your plank wall! The colors are perfect. This is something like what I am wanting to do in our master bath behind the vanities, then add a smaller mirror. Thank you Linda! And you vanity mirror idea sounds beautiful!